The first of the Ferraris built as a dual-purpose sports/racing car, the 166 MM was named "Mille Miglia" in honor of the previous year's victory in that most prestigious event. The groundbreaking body design was nicknamed Barchetta, or Little Boat, by an Italian journalist when it was first shown at the 1948 Turin Motor Show. Typical of the time, Ferrari built only the chassis and running gear. The coachwork was designed and built by Carlo Felice "Cici" Anderloni's Carrozzeria Touring. One challenge of restoring old sports racing cars such as this Barchetta is that, over time, many components have been repaired or replaced with whatever might have been easily at hand. In this instance, some answers to our questions of what was authentic came from trips to Italy to find original part specifications and to confer with Mr. Anderloni. 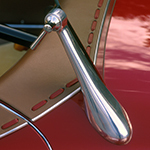 Other hints came from the car itself, such as the light engine turning, invisible due to the polishing of the steering wheel spokes in years past, revealed when the horn retaining ring was removed. The factory specification for the interior is Lusso, meaning that the car was delivered with an upholstered cockpit including carpeting, a leather covered dash panel, door panels, and Touring's trademark lacing on the perimeter of the cockpit. The surprise was the use of corduroy as the seat material, discovered during a close look at 0006's factory photos. Open cars of the period usually had leather seats. Even with our state-of-the-art facility, meticulous restoration is a labor intensive and time consuming process. In order to make this car as road worthy as it is beautiful, all of the wheel spokes had to be removed, repaired, replated, reinstalled, and trued - by hand. Re-spoking a fifty-year-old wheel is one instance where no amount of modern machinery can replicate the original manufacturing technique, and where the need for entrusting the work to a skilled craftsperson is evident. Automobile concours were originally conceived as an event that would showcase and award the most significant and beautiful new automobile designs of their time. At the 1949 Villa d'Este Concours d'Elegance in Italy, 0006M won the award for the best new sports car design. Our clients enjoyed entering this Barchetta at shows from Pebble Beach to Palm Beach and rallied it throughout New England. The final triumph was a trip back to Villa d'Este in April of 2000, where it repeated the honor for the best sports car. To complete the circle, the original creator of the Barchetta, Mr. Anderloni, was on hand to share in the fun and receive our thanks.